Doormen are the eyes and ears of New Yorkers, providing a personalised service to their residents and acting as a filter to the outside world at the same time. Twenty-four hours a day, seven days a week. "We handle people's dry cleaning, their food deliveries, take care of their pets and a couple of times we had to do some resuscitation," says doorman Bob Moll. But at many buildings such a high level of service can cost hundreds of thousands of dollars per year, a fee that is passed on to residents. The majority of smaller dwellings, with fewer people to share the cost, have to do without. But now there is a technological alternative that is becoming more popular - an operator who is stationed miles away who controls the latch. Security company Cyberdoorman installs a remote access infrastructure in your building, including a camera setup. Visitors who come to the front door intercom get connected to a live person offsite based in the South Bronx. They in turn call the resident at home or work to get permission to let the visitor in. Using an encrypted internet connection the service can remotely unlock multiple doors at the location, turn lights and sirens on and off, and send e-mail notification of deliveries to residents. Multiple video streams are securely sent back to base and stored using the latest compression technology, yet the voice part of the interaction is done through old fashioned analogue phone lines rather than VoIP (voice over internet protocol). Seth Barcus, security system design specialist at Cyberdoorman explains: "Although internet phones are so prevalent in the marketplace, if the internet went down we would lose contact. "With a regular phone line we can still speak to the visitors if the 'net goes down," he adds. The Cyberdoorman service is staffed almost entirely with women. Can technology be as effective as human interaction? Unscientific surveys have found them to be more popular than male voices and better able to defuse confrontations with fired nannies and dumped girlfriends for example, whose entry privileges can evaporate overnight. At Metro92, a building marketed to young professionals, the package room, a critical part of most lobbies, can be remotely unlocked remote and even has a fridge inside for fresh food deliveries. Twenty-five cameras monitor a visitor's every move and Cyberdoorman calls the police if someone starts acting suspiciously. While such a display of camera technology is common in other parts of the world, in America personal privacy has always been a closely guarded right and historically surveillance cameras have not been welcomed. Ken Dearden, owner of Metro92 says: "I think we've grown to accept it, particularly in urban areas in America. Everywhere you look there is a camera now." "We've grown accustomed to seeing a little black dome everywhere," he adds. 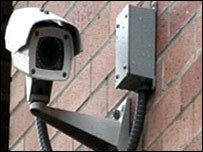 Residents at a nearby converted church can also see all the camera feeds themselves from within their apartments. But can screens and surveillance replace the real deal? There is one definite advantage that Bob has - he has lived in the area for nearly 60 years, gaining an intimate knowledge of the people and places in the neighbourhood that just cannot be matched by a remote service. Real estate broker Laura Hembree also feels that an onsite human presence has an irreplaceable value to many New Yorkers. Laura says: "I would say that in almost every building where there is a doorman, the residents establish a relationship with the doorman, their children grow up with them. "I think that relationship is very important in New York, where people feel like there's a lot of anonymity," she adds. 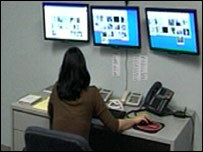 In fact, many Cyberdoorman users say they would like to see as well as hear the operator on the intercom. But such a simple request presents many problems, including increased bandwidth, the chore of visually pleasing backdrops and perhaps even uniforms for the Cyberdoorman staff. So it is likely they will remain behind a speaker for now.